Next weekend, 19-21 October in Howth, County Dublin republicans/Irish language activists and Gaelgeoirí from all over Ireland shall gather to celebrate and discuss the success of the Irish language renaissance and the reconquest of natural resources. The Sinn Féin Slógadh is an annual celebration of the language and this year augers to be the best yet. Packed with debates, tours, craic agus ceol the scenic surroundings of Howth in North Dublin shall provide an apt backdrop for this event. Slógadh Shinn Féin is the party’s annual Irish language gathering. It is open to all Irish speakers, learners of Irish and those with just a cúpla focail. It is taking place this year over the weekend of 19, 20 and 21 October in the Deer Park Hotel. This is the first time Dublin has hosted the Slógadh since it began in 1986. There will be debates, a historical tour, ceol agus craic. Mícheál Ó Seighin of the Rossport Five will deliver Léacht an tSlógaidh. “I welcome the news that Micheál Ó Seighin shall be at this conference as a special guest. Micheál personifies activism in today’s Ireland. “Sinn Féin is fully behind the Shell to Sea campaign and are proud to have Micheál as a speaker. “The theme of this year’s conference will be the reconquest of natural resources. 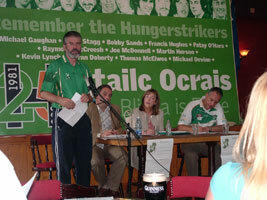 “Sinn Féin is the only political party to organise an annual Irish language conference. The Slógadh brings together Gaelgeoirí for debate, music and craic. It is open to everyone. All members are encouraged to attend and Sinn Féin’s Roinn an Chultúir request a special effort to encourage Irish speakers from outside the party to attend. Accommodation at a very reasonable rate is available in the hotel. “The organisers of this event from Roinn an Chultúir Baile Átha Cliath must be commended for their efforts in putting such an interesting clár together. The reconquest of natural resources is this year’s theme and we look forward to a healthy and hearty debate in Irish. “I am pleased to announce that Gerry Adams MP MLA, the Six County Sinn Féin Minister for Education Caitríona Ruane and EU MEP Bairbre de Brún will all be in attendance in what augers to be a truly revolutionary weekend. • For further information contact Eimear Ni Mhurchadha [email protected] or 087 9691620.